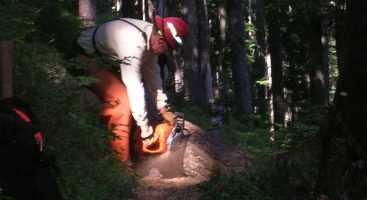 Pacific Crest Trail volunteers often use chain and crosscut saws to maintain the trail. To operate a chain or crosscut saw, volunteers must first be certified. 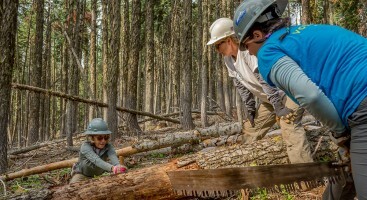 The Pacific Crest Trail Association helps volunteers obtain these requirements by conducting crosscut and/or chain saw certification and re-certification trainings for current PCT volunteers. Who can apply to the Saw Training and Certification courses? What is a PCTA Saw Training and Certification course? Why is a saw certification required for PCTA volunteers? What is the “textbook” for PCTA’s Saw Training and Certification program? What kind of boots do I need to operate a saw? Are there other materials I can use to assist with my saw training? The PCTA Saw Training and Certification program is open to PCTA volunteers and members only. PCTA volunteers are defined as individuals who regularly participate as a member of a PCTA trail crew maintaining the PCT. PCTA members are considered individuals who hold a current and official PCTA membership. Persons who have only participated in a PCTA Trail Skills College are not eligible for the Saw Training and Certification program. Admittance to a PCTA Saw Training and Certification course is based on numerous factors including the application process, previous saw experience or attendance at courses 103, 104 and 297 at a PCTA Trail Skills College, and recommendations from PCTA or partnering organizations or agencies. The application process is highly competitive. Submitting an application to a Saw Training and Certification Course does not guarantee admission. Initial Crosscut Saw Bucking Certification (2 days): Every crosscut saw operator must be certified to ensure safe and quality work. This session is for volunteers who do not have a USFS/PCTA certification card, but have demonstrated crosscut saw experience. The course will cover key crosscut safety procedures and best practices for clearing trail effectively in challenging and potentially hazardous situations. Day one is primarily classroom, and day two is mostly field evaluation. Candidates typically receive “A” level certification. Candidates who demonstrate extensive skill and leadership saw experience may receive “B” level certification. Falling certification is currently not available for volunteers. Crosscut Saw Re-Certification (6 hours): A safety and skills refresher and re-certification test to ensure safe sawing habits, up-grade techniques, and provide the opportunity for a higher level of certification. Initial Chainsaw Certification (2 days): Every chainsaw operator must be USFS/PCTA certified to insure safe and quality work. This session is for volunteers who do not have a certification card, but have sufficient previous chainsaw experience in the field. The course will cover key chainsaw safety procedures and best practices for clearing trail effectively in challenging and potentially hazardous situations. Day one is primarily classroom, and day two is mostly field evaluation. Candidates typically receive “A” level certification. Candidates who demonstrate extensive skill and leadership saw experience may receive “B” level certification. Falling certification is currently not available for volunteers. Chainsaw Re-Certification (6 hours): A refresher and re-certification test to insure safe sawing habits, up-grade skills, and provide the opportunity for a higher level of certification. 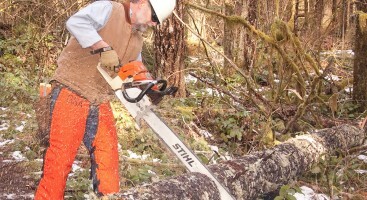 Volunteers who wish to lead log out of trails with a crosscut or chain saw must have sufficient experience and knowledge to pass a certification test. The following pre-certification classes are intended to give volunteers new to saws an orientation to the tools and get them ready to safely assist more experienced sawyers. After sufficient further experience they may wish to take a certification test. 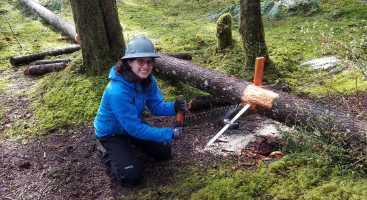 Someone who already has considerable experience with saws may apply to take the certification class without these pre-cert classes, though they will likely benefit from the 103 class if they have never done trail work. The classes listed below are offered at Trail Skills College events. 103. Basic Saw Crew Training: Are you interested in helping certified sawyers to clear trails, but don’t have much experience working with or around saws? Regardless if you aim to become a certified sawyer yourself, learning to be a saw crew member is an important place to start and takes know-how to do safely. This class provides field experience with crosscut saws & axes, but most of the principles are also applicable to chainsaws. Therefore, this class is the place to start, no matter what trail clearing tools you expect to use in the future. The session begins with an introduction to crosscut saws and axes of various types, and how they work. It then covers their safe and effective use, including a review of trail clearing specifications, safety equipment, the forces of tension and bind, and the practice of situational awareness. This class is an introduction; it does NOT provide saw certification. Intended for students who have already taken 103 Basic Saw Crew Training and are interested in an orientation specifically to chainsaws, in preparation for a chainsaw certification class. The class will not use chainsaws in the field, but it will cover things you need to know if you’ve never handled a chainsaw before, including how they work and why they are potentially dangerous. Also included is a review of specialized safety equipment & clothing needed, and how to start saws safely. If time allows, we will disassemble a saw to clean and sharpen it. 297. Chainsaw Practicum: This class is designed to allow volunteers who would like to earn a certification to use chainsaws the opportunity to work with an instructor to ensure they have the basic foundation skills necessary to enroll in a sawyer class. Classes 103 and 104 are recommended prior to attending this class. First Aid & CPR certifications are required to participate in 297 Chainsaw Practicum. Federal employees are required to have certification to operate chain or crosscut saws. Under the Volunteers-in-Forests (VIF) and Volunteers-in-Parks (VIP) program, PCTA volunteers working on the trail are considered government employees for the purposes of medical and tort claims and thus are required to meet the same certification standards as agency staff. The course instructor determines certification levels based upon observing a student’s proficiency with the saw during the field portion of the course. At the discretion of the instructor, a student may complete the course and not receive any certification. A level sawyers are required to operate under the direct supervision of a certified B or C level sawyer. Students who successfully complete a certification course will be sent cards indicating the level of certification achieved. If you are not affiliated with the PCT but are attending a PCTA-sponsored training event then you will be issued a certification card by the local USFS and in accordance with their certification levels. Saw certifications are valid for three years. When the certification expires, the individual must be field tested and re-certified. A current First Aid and CPR certification is required for a saw certification to be valid. PCTA staff and volunteers cannot operate chain or crosscut saws unless they hold a recognized and valid sawyer certification, first aid, and CPR card. After completing your online application, applicants will need to submit copies of their certification cards to the PCTA Sacramento office by email or mail ([email protected]; 1331 Garden Highway, Sacramento, CA 95833). If a current First Aid and CPR is not on file at the PCTA Sacramento office prior to the training, your registration will be terminated and you will be unable to attend. What is the “textbook” for the PCTA’s Saw Training and Certification Program? The PCTA and US Forest Service use a variety of training materials in the saw certification program. If you are accepted in to a PCTA saw training, you will be given the option to print the materials yourself or receive a copy in the mail. The materials you need to review are listed below. If you are training and testing for your…. MTDC Saws That Sing A training guide for crosscut use created by the Missoula Technology and Development Center. 71 pages. MTDC Chain Saw and Crosscut Saw Training Course Provides technical knowledge and skills for using the chain saw and crosscut saw safely. Created by the Missoula Technology and Development Center. 99 pages. Initial Crosscut Certification Quiz Volunteers applying for their Initial Crosscut Certification need to print, fill out, and bring the quiz to the training. Initial Chain Saw Certification Quiz Volunteers applying for their Initial Chain Saw Certification need to print, fill out, and bring the quiz to the training. MTDC Saw That Sings A training guide for crosscut use created by the Missoula Technology and Development Center. 71 pages. If you are an event coordinator holding a PCTA saw training, you can find the program documents (policies, evaluations, etc) here. See descriptions and images of acceptable footwear for sawyers. Saw Fuel Tank Safety (video) A 5-minute video about the causes of fuel tank pressurization, vapor lock and safe fuel handling techniques. Every Second Counts Chain Saw Safety (video) A 3-minute video about chain saw safety and precautions. USFS An Axe to Grind Information on the history, use, and purchasing of an axe. 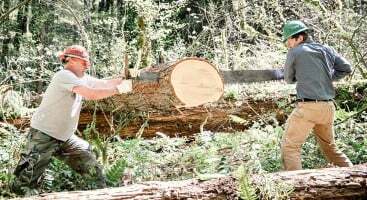 The Crosscut Sawyer Free online training from the Arthur Carhart National Wilderness Training Center to help sawyers prepare for crosscut certification.